← Red Bubble – T-shirts for sale! For this edition of Imagining Islamic Aesthetics we shall look into the interesting topic of Jaalis. 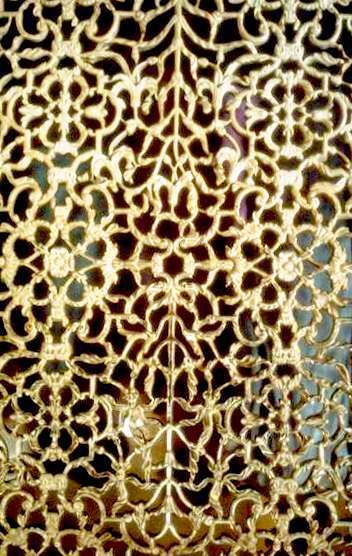 Jaali or Jali (Gujarati જાળી) is the term used for perforated wooden or stone screens, or more exactly, latticed screen, usually done in an ornamental, geometric designs and sometimes calligraphy. It is a very prominent architectural decoration feature in Muslim India. Earlier designs uses stones or wood as a medium for these Jaali, but during the Mughal emperors reign in South Asia, Jaalis are given a more elegant look with the usage of semi-precious stones as inlaid decoration and marble instead of stone as the medium. Jaalis are comparable and is the parallel of Mashrabiyas in the Islamic world as a decorative element in architecture, however some differences make these two unlike each other. We will cover the topics of Mashrabiyas and the difference between these two in other categories. Most notable and finest examples of Jaalis are to be found in obviously India’s and other neighbouring countries tourism venues such as the Taj Mahal or the Humayun’s Tomb. 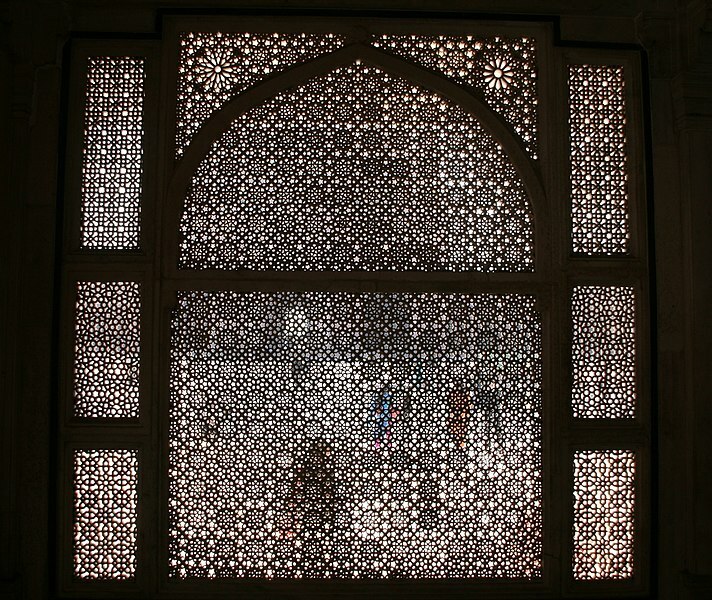 A Mihrab (Niche indicating the direction of Mecca, the Muslims holiest city, of where they direct their prayers to) decorated with Jaali pieced screen. Done in marble, this fine example is found in Humayun’s Tomb, India. 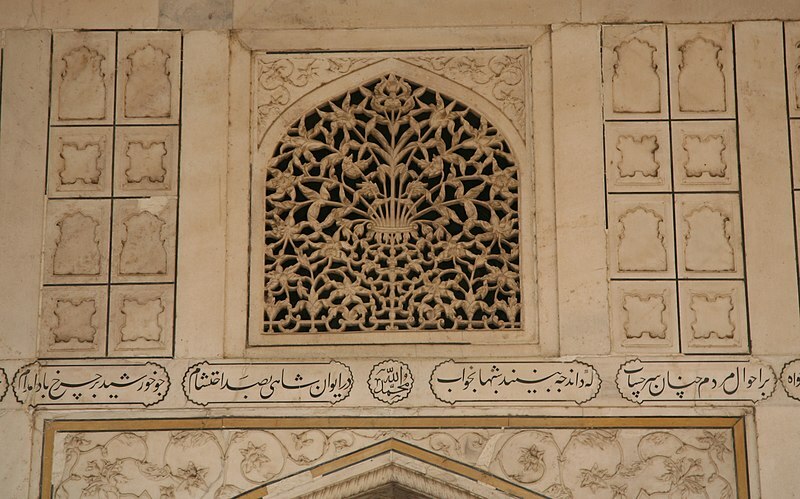 Detail of Jaali in Taj Mahal, India. These intricate carved designs of pierced screen decorates around the cenotaphs of Mumtaz Mahal and the commissioner of the Taj Mahal, Shah Jahan. Author - This photo was taken by Hans A. Rosbach. A Jaali abouve a portal in the Diwan-I Khas of the Red Fort, Agra, India. Another fine example, it also shows that most Jaalis have Geometrical designs for the decoration. 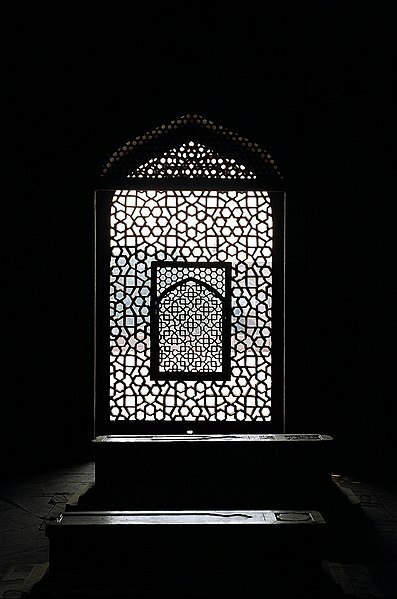 This also draws up of a parallel in Islamic decoration – the Chamsiyya, a decorated screen window above portals intended so that natural sunlight pours through it. 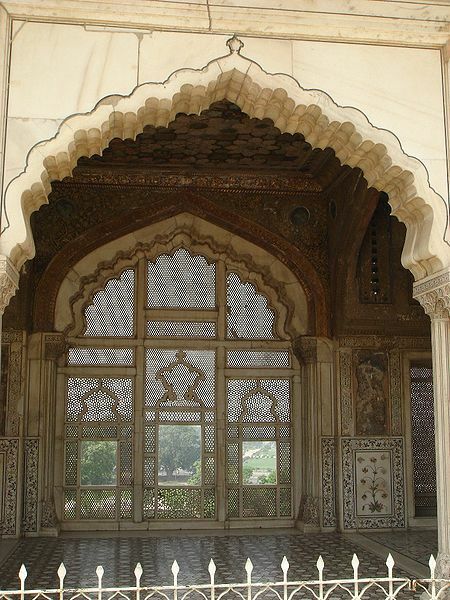 Another fine example of Jaali in the Lahore Fort, in the city of Lahore, Punjab, Pakistan. while this example is hard to appreciate, you can see the effect these pierced screen brings forth – privacy of the onlooker from inside of the building without revealing themselves to the outside world. a complicated design for a Jaali in Salim Chishti Tomb, India. Complicated, abstract and complex designs are not uncommon in the execution of Jaalis, and extensive usage of Geometrical design is a characteristic of Jaalis.